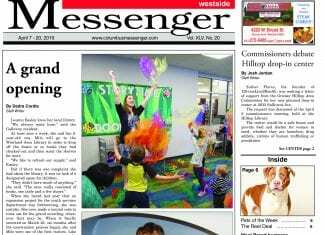 Be sure to read the Westside Messenger to find out what’s going on in your neighborhood! 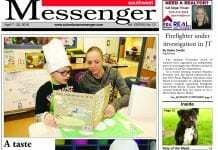 To submit events and announcements to this section, e-mail information to westside@columbusmessenger.com. Hilltop United Methodist Church Women’s Bazaar will be held Saturday, Nov. 17, at the J. Ashburn Junior Youth Center, 85 Clarendon Ave., from 10 a.m. to 4 p.m. Contact Ruth Middlebrooks, at614-515-1217 or Melody Williams, pastor, at 279-8086. The Dodge second annual All Ages Talent Show will be held Thursday, Nov. 8, at 7 p.m. Call 645-8151 for details. The Dodge Senior Center will host an “Honoring our Veterans” breakfast, Monday, Nov. 12, at 10 a.m. The cost is $4, veterans eat free with some proof. Sign up at hostess desk by Nov. 8. Dodge Senior Center is holding free hearing tests and screenings on Thursday, Nov. 15, from 10 a.m. – 3 p.m. by appointment only. Call Hope at 261-5452. Free hearing aids are available for those who qualify. 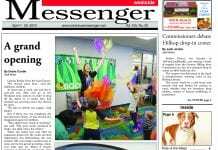 Dodge Senior Center is hosting an All Members Reception on Nov. 16, at 1 p.m. Entertainment will be “The Gingersnaps,” a lively dance team. Light refreshments will be furnished. There is no cost for the event and reservations are not required. Dodge Senior Center’s annual Thanksgiving Luncheon will be held Thursday, Nov. 15, at 11:30 a.m. Cost is $6. Reservation deadline is Nov. 9. Call 645-8151. Dodge Senior Center will hold a senior council meeting, Tuesday, Nov. 13, at 1:15 p.m. All members are invited. “Aglow, a network of caring women” will meet at 9:45 a.m on Nov. 14, at the Potter’s House, 3220 Lowell Dr. in Columbus. A continental breakfast will be served for $5. Speaker will be Karen Jackson of Refreshing Springs Ministries. She will speak on “How to Enter into God’s Rest.” The reservation deadline is Nov. 10. For reservations and more information, contact Nancy Martin, at 875-5388; Ann Joseph, at 889-1708; or Elaine Heilman, at 263-0607. There will be a senior luncheon on Tuesday, Nov. 13 at 12 p.m. at Westgate United Methodist Church, 61 S. Powell Ave. The entertainment will feature Steve Stone sharing experiences and slides of his climb of Mt. Kilimanjaro. Open to the public. Donations accepted. Parkview United Methodist Church’s paper recycling program is beginning its fifth year. Newspapers, junk mail, catalogs, and more can be dropped in the green and yellow recycling bins in the church’s parking lot, at 344 S. Algonquin Ave. No cardboard or telephone books. DivorceCare recovery seminar and support group will meet at Cypress Wesleyan Church, 377 Alton-Darby Creek Rd., in Galloway each Sunday at 6 p.m. now through Nov. 18. DivorceCare for Kids (DC4K) will be offered at the same time on Sundays and children, ages 5 through 12 are welcome to attend if you are in the DivorceCare class. There is also other children’s programming offered for infants through 12th grade. To register or to receive more information, please call Debbie Brisentine at the church office, 878-8192 ext. 238. You can also check out the DivorceCare Web site, www.divorcecare.org for information on both DivorceCare and DC4K. These programs are provided through a grant from Mt. Carmel hospital. For additional information, call 878-5110. The Greater Hilltop Area Commission seeks community members to serve on various committees for the 2007-2008 commission term. Committee members do not have to be members of the full commission. Interested persons can learn about the commission and get more information online at www.TheGHAC.com. Awana Clubs for boys and girls, from three-years-old to sixth grade. These clubs meet on Wednesdays, from 6:45-8:30 p.m., at Briggs Road Baptist Church, 3231 Briggs Road. Call 272-7430 for more information. Women’s Bible Studies at Cypress Wesleyan Church for fall include “A Women’s Heart – God’s Dwelling Place” and Daniel: Lives of Intregrity; Words of Prophesy.” Both works are by Beth Moore. Classes offered on Thursday mornings and evenings, and Sunday evenings. Call the church at 878-8192 or visit the Web site for more info at www.cypressonline.net. GriefShare recovery support group will be hosted by Cypress Wesleyan Church in Galloway each Sunday at 6 p.m. through Dec. 9. The class will meet in the District Center, 457 Alton-Darby Creek Road (the brick building north of the church, close to the railroad tracks). Children’s programs are being offered at the same time for infants through 12th grade at no cost. To register or to receive more information, call Debbie Brisentine at the church office, 878-8192 ext. 238, or visit the GriefShare Web site, www.griefshare.org. The Franklin County Commissioners will host a series of free lunch hour courses geared towards helping residents and county workers enjoy healthier lives. The courses will be held each Wednesday through the end of the year and are open to the public. Those who attend the courses will receive lessons on healthy activities such as golf, ballroom dancing, cooking, exercise and more. Each session begins at 11:30 a.m. in the first floor lobby of the Franklin County Courthouse, 373 S. High Street. For the schedule of classes, visit www.FranklinCountyOhio.gov/Commissioners. Friends Worship Center, 3030 Clime Rd., will host “12 Step Recovery: Celebrate Recovery” for all addictions including co-dependency every Thursday from 7-9 p.m. Come early, stay late for fellowship. For more information, call 279-1892 or 395-6309. Looking for past members of the Briggs High School marching band, flag corp. andmajorettes for a homecoming reunion. Contact Teresa Wamsley-Baker at briggsbandalumni@aol.com or 419-3358. Plans are underway to form a Ladies Auxiliary Group at AM VETS Post 300. All post members are asked to participate in this open enrollment. All women that are related to a Post 300 member (grandmother, mother, wife, daughter, sister, aunt) are encouraged to join and support our military families. Please contact the Post Commander, Barbara Megoloff, at 614-276-8083 for more information. Remember, all good deeds start with the family. Franklin Heights High School Band Boosters will hold its annual Holiday Crafts Bazaar Dec. 1, from 9 a.m.-4 p.m., at Franklin Heights High School, 1001 Demorest Road. Crafters of all kinds are needed to set up tables and sell their wares. Tables are $25 each, plus a charge of $2 if electricity is needed. Reserve your space today by calling Deb Kakos at 275-4480. The craft bazaar is an annual fundraiser for the Franklin Heights High School Marching Band and is sponsored by the Band Boosters. All proceeds from the event will benefit the Franklin Heights Marching Band. The Dodge Senior Center, 667 Sullivant Ave., will hold the Walkers’ Annual Homemade Cookie/Candy Bake Sale, Tuesday, Dec. 11, from 9 a.m. – 1 p.m. The Dodge Senior Center, 667 Sullivant Ave., will host a Christmas Luncheon Party, Thursday, Dec. 13, at 11:30 a.m. Cost is $6 per person. Reservation deadline is Dec. 7. The luncheon will be followed by a holiday game, baskets of goodies for auctioning, plus more goodies to take home. “The Man” will be here, too. As we did last year, please bring an unwrapped gift up to age 11, for the neighborhood childrens’ Christmas Party, marked for a boy or girl. Bingo Thursday will be held at the Dodge Senior Center, 667 Sullivant Ave., Dec. 13, at 12:30 p.m. Bring $l worth of non-perishables goods and receive 3 cards; $2 worth gets 6 cards. Place your orders now for Crossroads United Methodist Church’s chicken and noodles. The quarts are $6 each and can be picked up Nov. 17-18 at 1100 S, Hague Ave. Call Carol, at 276-4610 or Ruth, at 274-4426 to order. The Westland Area Business Association is holding a luncheon meeting at noon on Wednesday, Nov. 14 at Columbia Heights United Methodist Church, 775 Galloway Rd. Contact Ardis Offensend at 878-4466 or ajodanhurst@aol.com no later than Nov. 2 to register. Non-Catholics who are interested in the Catholic religion, whether or not they expect to join the church, are invited to raise their questions at St. Cecilia Church Nov. 14. Catholics will be on hand to explain the church’s teachings on the second Wednesday of every month, 7 p.m., in the meeting room. The primary goal of this is to facilitate a better understanding of Catholic beliefs and doctrines for those interested in finding out more about the Catholic faith. It is not the intent of the program to compel anyone to conversion, but, to merely answer questions about Catholicism. The topic for each session will be determined by the questions of the inquirers; there will be no pre-set agenda. Persons may come for one session, or continue to come for several months, or come now and then. The setting will be informal. St. Cecilia Church is located on the southeast corner of Norton Road and Sullivant Avenue. The meeting room is in the parish center on the lower level; enter the building from the east side. Call the parish office at 878-5353 with questions. No preregistration is necessary. The Greater Columbus F.W.B. Church , 2546 Briggs Road, will be presenting “The Gates of Hell” Nov. 30 and Dec. 1 at 7 p.m. Admission is free but seating is limited – arrive early. Contact Tim Young at 853-1142 with questions. The Southwest Area Commission usually meets on the third Wednesday of each month. Due to the holidays, the dates of the November and December meetings have changed to Nov. 14 and Dec. 12. 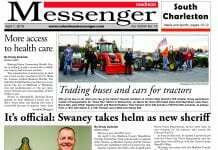 The November meeting will be at 7 p.m. at the New Horizons United Methodist Church, 1665 Harrisburg Pike. The agenda will include discussion about development of the area plan by representatives from the jurisdictions within our area and by representatives from health, schools and transportation. Visit the Web site, www.columbusswac.org, for additional information about the commission. The commission welcomes the involvement of area residents. The commission boundaries are the Scioto River on the east, I-270 on the south, the railroad tracks west of Harrisburg Pike on the west, Mound Street to Mt. Calvary to Greenlawn Avenue on the north. The commission can be contacted through the Web site, or by phone at 562-4728. Bishop Ready High School will be holding its annual Open House for prospective students and their parents/guardians on Sunday, Nov. 18. The general information session begins at 1 p.m. and tours and departmental presentations will continue until 3:30 p.m. The school encourages students from grades 5 through 8, as well as any high school student considering a transfer, to attend this afternoon event. It’s a chance to learn about the academic, co- and extra-curricular, and spiritual dimensions of a Bishop Ready education. Administrators, faculty, and students will be available to answer questions and present a capsule view of life at Bishop Ready. The school is located at Salisbury Road and Mound Street in west Columbus and ample parking is available. For more information, call Mr. Joe Lang, director of admissions at Bishop Ready, at 276-5263, ext. 201. Refreshments will be served. The Village of Valleyview will provide leaf pick up to residents on Nov. 13 and Dec. 3. All leaf piles should be placed loosely in the flat portion of the road right-of-ways, not in ditches or alleys. No bags or boxes will be picked up, and no other yard waste except grass clippings may be added to the piles. The Parkview U.M.C. Young at Heart Club will meet Nov. 14 in the fellowship hall at noon. The menu will be sloppy joe’s and more. The program will be presented by the Dodge Senior Center Chorus, singing selections of musicals written by Richard Rogers and Oscar Hammerstein. Everyone 55 and older is welcome to attend and bring a friend. Call Bettie Gourley at 279-1662 for more information. There will be a winter version of the fall sale at Hoge Memorial Presbyterian Church, 2930 W. Broad St., on Dec. 8, from 9 a.m. to 3 p.m. There will be many bargains. The Columbus Literacy Council is holding an informational session about tutoring and other volunteer opportunties on Saturday, Dec. 1, 9:30 to 11 a.m. The session will be held at the CLC office, 195 N. Grant Ave. To register, call Norma Wetzel at 221-5013. The Life in Christ Fellowship MOPS (Mothers Of PreSchoolers) meeting will be Nov. 14. Each mom is to bring her favorite appetizer or snack to share, along with the recipe. After sampling and sharing, guests will continue to explore this year’s theme, “the HOME factor.” Then the creative activities director will teach how to make peanut brittle and toffee, just in time for the holidays! 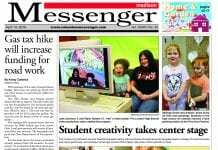 Meanwhile, children will enjoy stories, crafts, and snacks in their own MOPPETS program. This group meets in the New Life Nazarene Church, located at 2020 State Route 142 NE, West Jefferson. It’s not too late to join. Call Pam at 614-853-2532 or Lois at 614-878-3535 for more information. The West Columbus Christian Women’s Club luncheon will be held Nov. 13, from 12-1:45 p.m., at the Heritage Golf Club House, 3525 Heritage Club Dr., Hilliard. Cost is $14, babysitting is free. The guest speaker will be June Cole, with vocalist Leon Myers and special feature Marlene Keyes from Art to Wear. Reservations and cancellations are required for the luncheon and nursery. Call Betty at 851-0611 or Audra at 77-5578. Assistant City Attorney, Jody Spurlock, will be speaking at a meeting regarding “The Zone Initiative,” a program started by Columbus City Attorney, Richard C Pfeiffer, to improve communication between the City Attorney’s Office, the Columbus Division of Police, Code Enforcement, the City Dept. of Health and Sanitation, neighborhood associations and other community organizations in order to aid in enhancing Columbus neighborhoods. The meeting will be held Tues, Dec. 4, from 7-8:30 p.m. at Westland High School’s ERC.